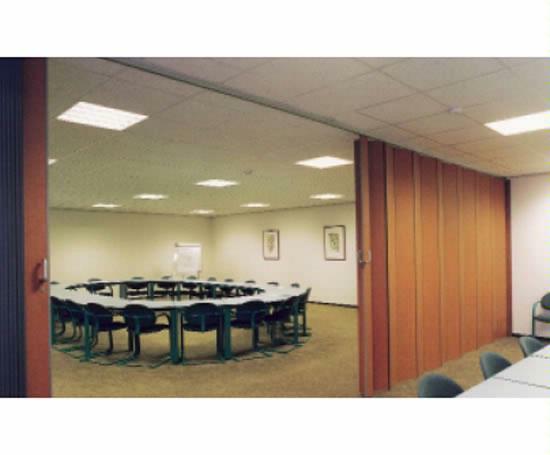 Movable Partition Walls, the flexible space configuration, with little effort rooms can be partitioned, made smaller or larger to suit individual requirements, from conference rooms, school classrooms to large exhibition halls. Options include single or double inset pass doors, glazing panels, virtually unlimited track arrangements and surface finishes, with melamine probably being the most popular. The best door for maximum acoustic performance, with variable options on sound reduction from 36dB (Rw) to 58dB(Rw). Also available with 30 and 60 minute fire resistance. Manual or Semi automatic operation. The quick and easy way to divide a room, whether in an office, church hall or village hall, meeting rooms or school classrooms. 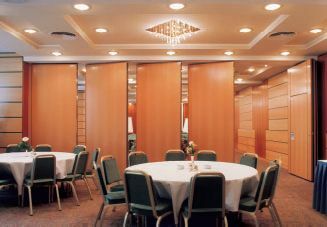 This type of acoustic folding partition, is top hung, with no floor tracks, double skinned timber panels, available as single doors, bi - parting or with free floating sections for very large openings. Available as concertina folding door, or as flat wall configuration, unlimited surface finishes including real timber veneer, and melamine laminate being the most popular, with a choice of 17 colour options as standard. This robust, non acoustic, accordion style, single panel folding partition door system, is light weight in comparison to acoustic doors, easy to use and a very economical solution to dividing space more effectively. Top hung with no floor tracks, timber laminate panels, with various surface finishes, including choice of 17 melamine laminate colour options as standard. This type of folding partition is suitable for use in both domestic and commercial applications, including offices, schools, hospitals, leisure centres, hotels, bars and many more. Sound reduction 28 and 31Db(Rw). A top hung folding partition for the smaller opening, in timber laminate with various surface finish options. 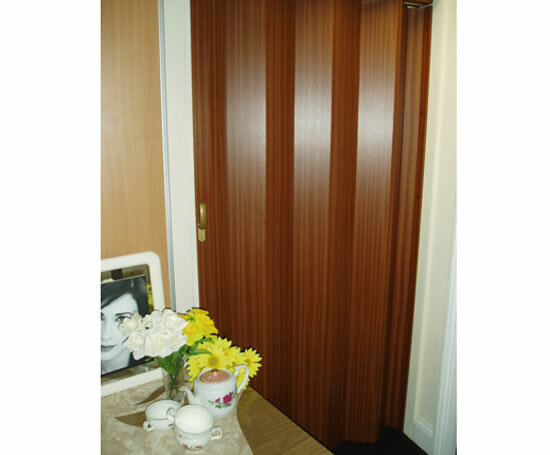 A door ideally suited for use in the home, or light commercial applications, great for space saving to replace a normal hinged door, on larders, utility rooms and for partitioning open plan or L shaped rooms, helping to conserve heat, and although non acoustic, also helping to cut down on noise pollution. Two panel sizes and various models available, including real timber veneer and glazed panels. 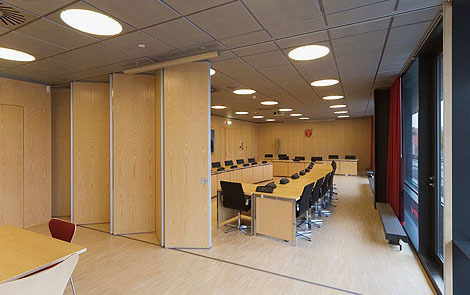 An easy to operate, flush folding partition door system, 65mm thick continuously hinged panels, with last panel acting as communicating pass door, available in two versions as Centrefold or Endfold. Options include top hung with no floor tracks, top hung with floor tracks, or floor supported with surface mounted or recessed floor track. The timber constructed panels have flush fitting protective aluminium edge profiles,and the surface finish is available painted, wood veneer or in a range of standard melamine laminate colours. Sound reduction 31- 46 dB(Rw) laboratory tested, 48dB(Rw) panels 100mm thick. Also available in 30 and 60 minute fire rated versions. 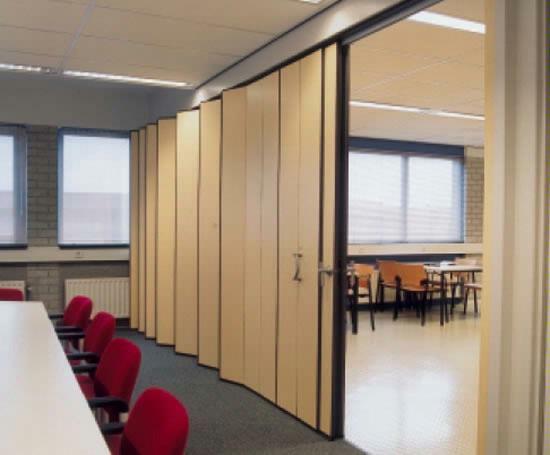 Vinyl fabric folding partitions, top hung, often used in schools, and halls, an economical solution to dividing space, comes in two systems, Wideline and Slimline. 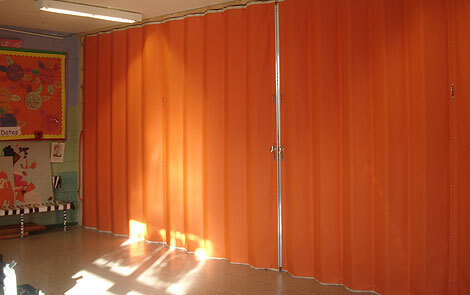 The fabric is very durable, light fast, flame retardent and rot proof, comes in choice of 24 standard colours. Options can include curved tracks, clear see through panel. Sound reduction available 15 24 30 and 35dB max.